See below for helpful articles and resources to learn more. 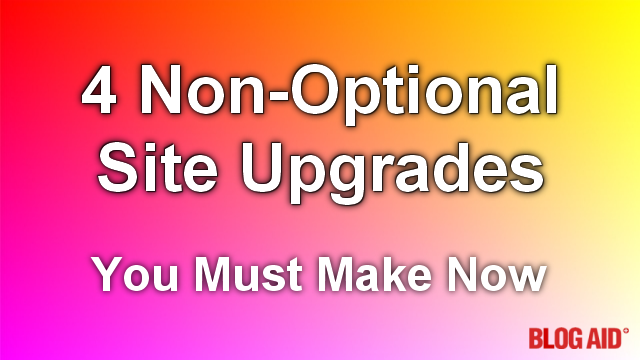 Penalties are rolling out every day for sites that don’t get on the bandwagon with these upgrades. Bottom line, your traffic will go down. There are 2 main reasons your site is now at high risk for breaking in 2017 and beyond. PHP is the language your site runs on. Most site owners have never needed to concern themselves with the PHP version at their host. For both security and performance reasons, hosts desperately need to move all sites up to PHP 7, but they can’t. A sudden switch to PHP 7 could break a site. That’s why you need to test first. The move to PHP 7 is being held up by sites that run older, unsupported plugins and themes and by site owners who don’t bother to check those things. The PHP 7 train is already in the station. Here’s what is already happening. As supported theme and plugin developers upgrade their code to be PHP 7 compliant, they are dropping support for PHP versions below 5.6. Your theme and plugins will start to break on lower PHP versions as you upgrade. You don’t want that kind of unexpected surprise, do you? Then get on the PHP 7 train now. Security and performance go hand-in-hand. If you think paying a qualified webmaster to get your security fixed is high, just wait until you see the bill for any of the above!!!! DIY security measures and plugins are a joke! Those behemoth security plugins just waste more site resources and give you a false sense of protection. Real site security starts at the host, below your WordPress files and extends outside your host to kick bad bots to the curb before they even reach your site. Who’s Pushing For All These Changes? Google is not the only one beating the drum on these site upgrades. All entities involved with websites are standing in unity over it. Yes, even Facebook is now considering site speed as a Reach factor for your links. And more site related entities are jumping on the bandwagon. Let me help you get past your excuses. None of this is going away. It’s not going to get any cheaper. You won’t have any more time later. That last one is a biggie!!! Every site that has upgraded is zooming past you. You’re putting your money maker at high risk. If you wait until after penalties and breaks and attacks hit, you’ll be doing all of this under duress and at the least convenient time. You’ll be doing it anyway. Why not make a plan? Why not get a guide to help step you through it and make it easier? Below are links to recommended reading so you can help yourself get going with all of this. Some things you can easily do yourself. Some things you might need to hire a qualified web tech to do. Either way, these articles will help you make a plan and just get it done. Run your own PHP 7 compatibility checks and make the switch at your host. Step-by-step guide on running your own checks. Do Free Malware Scanners Really Work? Need Security and Performance Help? You’ll see the real security holes and resource hogs on your site. Goes way beyond what you can see from within WordPress. On average, I find 26 issues that no plugin can detect. Want to learn how to set up sites securely that perform fast? Need to know how to convert sites to HTTPS? Thanks MaAnna for this very needed information. By the tine sites realize they really need to make these changes, snd CORRECTLY the damage will already have started and it can take months, many months to recover what they have worked so hard to obtain. Should be quick fixes Marilyn and no long recovery. Just trying to help folks avoid, prevent, and get ahead of the curve. Way easier and cheaper than after the site breaks. Do have any advice for those of us that use Host Gator when it comes to shifting to PHP7? Paul, best to contact HostGator support to get specific help with switching to PHP7. I’m assuming they have it available if they are keeping up with Apache and cPanel and Centos updates on their servers.